I want you to imagine yourself a child. A fun little kid that loves to play! You play inside, you play outside, you will play anywhere! 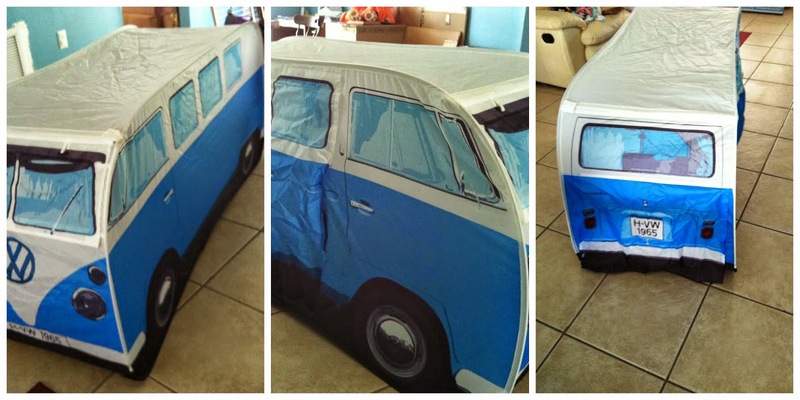 Now, imagine what you would do with a VW Campervan Play Tent! Do you feel that smile on your face? That is the exact smile I saw on my daughter's face when I showed her this wonderful Campervan Play Tent! This specific product I am talking about is made by The Monster Factory! 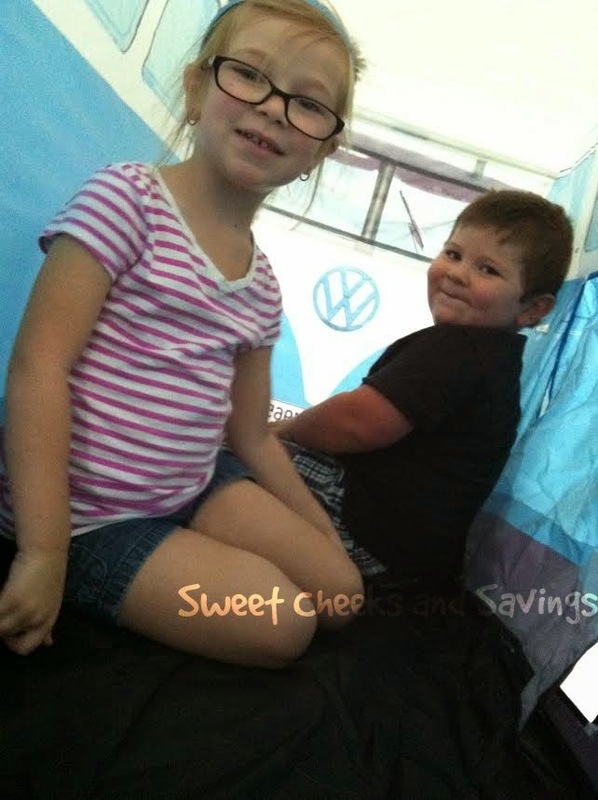 If you're having a hard time imaging yourself as a child, with the smile on your face while you play with the VW Campervan Play Tent, then just imagine yourself as an adult and having so much fun with the adult size tent! Established in 1998 by Martin Grix, The Monster Factory is an award winning greeting card, gift and more recently outdoor and camping company. When I was given the chance to bring you a review of this campervan, I got really excited. Not only because its simply awesome, but because I knew how much fun my children and even myself and husband would have inside these 4 walls! I may have been behind the camera in these pictures, but I'm sure you can imagine me down on my floor camping out in my children's new van! The Campervan is super easy to put together. You let it unfold itself once out of the spare tire bag. Add the four tent poles and you are good to go! Now, putting this thing away is a different story! There are directions to follow and I needed my husband's hands as well as my own to get it in the right shape. After you've become your own mechanic and built your VW Campervan, you are ready to play! As you can see in the pictures the outside is a little wrinkled from being in the spare tire. I noticed through the next couple of days of having this set up, the wrinkles went away. The children have played in it for hours! Movie times, sleeping for the night, at one point they had over 20 stuffed animals in there with them! I did notice one small issue with the tent. If you drag this along the ground, the fabric on the bottom may tear a little. Cooper keeps pulling the tent from the living room to his room, then an hour later I'll see Ally pull the tent into her room. It rarely stays in one place. With all of this movement, the fabric that covers the metal boning is getting worn. The happiness I have seen on their faces and heard in their voices is priceless! Any product that can bring this many smiles should be in every home, in my opinion! My boys would LOVE that. And this would save me from having to tear down their blanket forts all the time LOL. 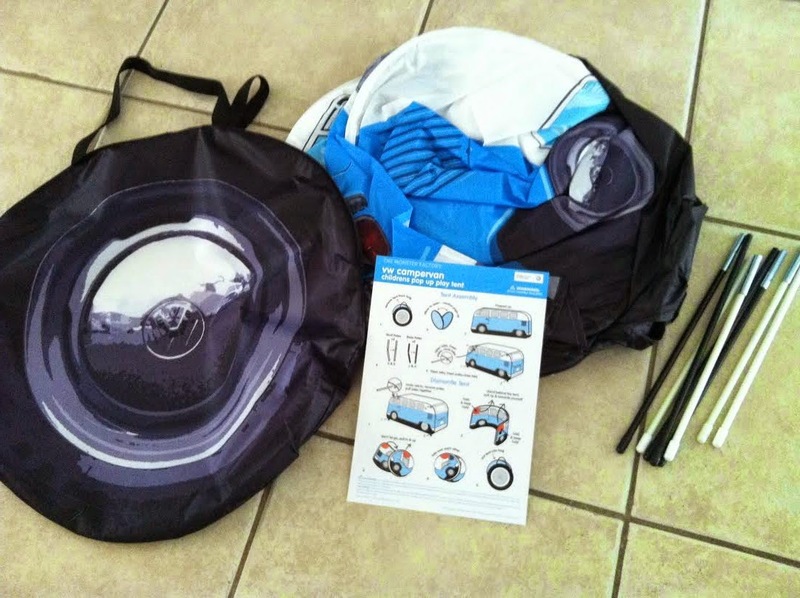 I have a friend that is a VW fanatic who would love this play tent for her daughter. I might have to pick one of these up. Yes. They can be found on the website. My kids adore things like this! Looks like so much fun! Ahhhh I 've seen this and love it. I love this because it is so different from the other pop up tents I've seen. What a neat idea! My kids used to love to play in tents when they were little and now they could have their own. I love that it looks like a Volkswagon bus! Oh how fun! That is really cool and my kids love tents. They'd have a blast! That is such a cute idea! Your kids are adorable and look like they're loving it in there! OMG! I have to have one of those! My kids would love it! I want to take the adult sized tent camping just for fun!! How cool. Can I come play this looks like lots of fun for kids. My kids have one of these and they love it. I love that it folds up nicely for storage! That is so cute, I had no idea they made these. I am such a big VW fan, I am not sure I would share with my kids! My boys have this camper van and they love to set it up in the living room and have sleepovers. It's really cute and roomy. That is cute! It's like a tent but a VW. I would've loved that as a kiddo. Now that is a genius idea. So much easier than blanket forts and easier to play in and around. This would make a great Christmas gift for my small nieces and nephews. I got this last year and my kids loved it! They still play with it although not as much. Great for outdoor play. That looks like such fun! My kids loved a round tent we used to have when they were little. It was constantly filled with stuffed animals and being moved. That is such a cool tent! I love how it looks like it's super easy to set up. This is absolutely adorable. We love VW, we currently have a bug, and many years ago I drove a red Golf for a long time. Oh what a cute kids tent! My kids would enjoy it if we have one too. Oh my goodness, I NEED one of these! My son would just love it. I love WV vans and it is my dream to someday own one. Too bad this wasn't adult size! A tent that looks like a car? My kid would FREAK! How much fun is that?? Oh my ... my kids LOVE to play camping at home! They want to go camping for real too but we have not been able to yet. Hopefully soon, but they would love this for sure! That does look like so much fun! I've added it to my list for a certain someone! I love this! My son would probably never want to get out of this tent. The pretend play possibilities are infinite. No wonder they love it so much! This tent is too cute. It reminds me of the VW van we had when I was little. Thank you for reminding me of my childhood.